Two hundred years of stories to discover. As you stroll round Russell, Bay of Islands today you’re walking back in time. The town’s original street plan and names from 1843 are still intact and feature some of New Zealand’s oldest and most significant historic buildings. Christ Church 1835-6. Te Whare Karakia o Kororāreka, the oldest existing church in NZ. 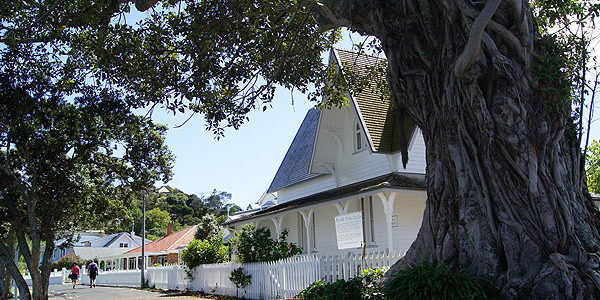 Building began in 1835 with the first service, conducted in both Māori and English, taking place on 3 January 1836. Look for the musket ball holes in the old weatherboards left from the 1845 Battle of Kororāreka. Pompallier Mission 1841. Bishop Pompallier established the Roman Catholic Mission in Kororāreka in 1839. The building there today was built in 1841 and is now restored to its original French Lyonnaise layout as a working printery again. The Old Customs House 1870 Built from a Gothic design by W.H Clayton, the first Colonial Architect to New Zealand. With the eventual drop-off in shipping the customs house was no longer required and the Police Department agreed to take it over. The huge Moreton Bay fig next to it was planted in the 1870’s. Flagstaff Hill. Above the town on Maiki Hill stands the famous flagstaff, cut down 4 times between 1844 and 1845. It flies New Zealand’s original flag twelve days a year. The views from the top are spectacular. Russell Museum. The treasure house of Russell – Te Whare Taonga o Kororāreka. One of the finest little museums in the country. It chronicles our Māori and European history and holds some noteworthy and unique collections – including a stunning 1/5th scale replica of Cook’s ship Endeavour. Rewa’s village Drawings of Kororāreka from the early19th C show a Māori village on the waterfront. This was chief Rewa’s kainga. Today it’s the site of the Russell Museum and the Kororāreka Marae Society’s wharemahi and art gallery named Haratu in honour of Rewa’s original whare. New Zealand’s first capital. Kororāreka was considered too unsavoury to be the capital so the capital was established up harbour at Okiato and called Russell. Little remains there now but the site is an historic reserve and has new interpretation signage. The Gables 1847 One of the oldest buildings in Russell, the Gables is listed with the Historic Places Trust. In its time it has been a bordello, bakery, shop, Salvation Army boys’ home and even a hiding place for sailors who had jumped ship. New Zealand’s First Licensed Hotel After New Zealand became a colony in 1840 all hotels selling alcohol had to have liquor licences. The country’s first was granted to John Johnson of the Duke of Marlborough Hotel in Kororāreka. The hotel in Russell is the fourth on the site.